Taking Prescription Adderall Increases The Risk Of Substance Abuse? This entry was posted in Substance Abuse and tagged Adolescents, Managing Symptoms, Prescription Medication, Stimulant on August 10, 2016 by Team Addiction Hope. Physicians often prescribe stimulants such as Adderall to manage the symptoms associated with attention-deficit/hyperactivity disorder (ADHD). Treatment often begins at a young age, although adolescents and adults may receive first-time treatment too. 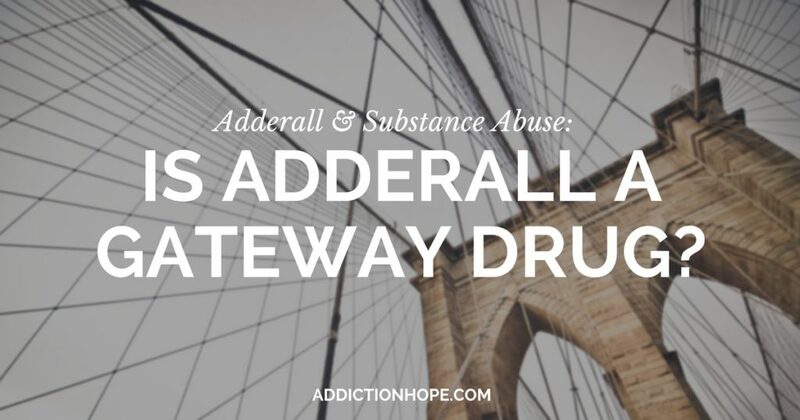 While the stimulant effect can help some individuals manage their symptoms, medications such as Adderall may contribute to a risk of future substance abuse that healthcare professionals don’t fully understand. Almost one out of every eight senior high school students in the U.S. has taken medication for ADHD. This statistic serves as the background for researchers interested in discovering a link between stimulant medication and illicit substance abuse. A study published in the Journal of the American Academy of Child and Adolescent Psychiatry in 2016 evaluated over 40,000 students, including 3,500 who took a stimulant medication and 1,300 who took a non-stimulant medication for ADHD. The study compared this information with the rates of teenage binge drinking, smoking and other drug usage. The study discovered a correlation between using a stimulant-based drug, such as Adderall or Ritalin, at older ages for shorter durations and instances of additional substance abuse. The study didn’t uncover a causal link between the two conditions, but it did raise concerns about treatments for ADHD in adolescents and the need for precautions to avoid a serious risk of drug abuse. Teenagers who start to battle substance abuse problems usually face an ongoing struggle later in life. Taking a stimulant or non-stimulant medication to treat ADHD may not provide the answers parents, patients and loved ones need. Without a better understanding of the link between ADHD medications and illicit substance abuse, parents may want to explore alternative treatments to protect their children from the potential risks. Adderall is classified as a Schedule II controlled substance in the United States, meaning that it has a well-known potential for abuse. The medication includes a mixture of amphetamine and dextroamphetamine – both of which are stimulants. For people who have narcolepsy or ADHD, Adderall can improve alertness and focus. Prescription doses vary between individuals, often ranging from 5 to 30 mg once or twice a day. Health care professionals may recommend Adderall to students with ADHD to help them focus on their studies and behave appropriately in class. Some patients start the medication as young as 3 years old. As with any controlled substance, however, a physician should only prescribe a stimulant or non-stimulant ADHD medication as a last resort. Learn more about Adderall here. Instead of prescribing Adderall for children and adolescents, health care providers are parents could explore additional treatments. Therapy and holistic care often provide similar benefits, but in a natural and health-promoting way. These solutions may require some trial and error, but, then again, so does medication treatment. Exercise. Consistent exercise can calm and focus an energetic mind and body. Consider participating in a regular sport or a repetitive-motion activity such as biking. Over a few weeks, you may notice your child beginning to focus and remain calm during quieter activities. Focus on nutrition. Highly regarded physicians and researchers now recognize the power of nutrition in treating mental health symptoms. To protect brain and body health, we can naturally treat our bodies with whole foods and supplements. Omega-3 and omega-6 fatty acids found in supplements, some seeds and fatty fish support brain functioning and may fight against the symptoms of ADHD, depression and memory loss. Other supplements that may help include zinc, absorbable forms of magnesium, and vitamin B complexes. Avoid certain foods. In addition to the right supplements, individuals with ADHD should avoid caffeine, sugar and processed foods to manage their symptoms. Whole, natural foods offer more nutrients, balance weight and improve mental focus and clarity. Meditate. As part of a therapy regimen like dialectical behavioral therapy or cognitive behavioral therapy, meditation can teach those suffering from ADHD to focus on the present and maintain a calm but aware energy. Mindfulness meditation, thought redirection and transcendental meditation are all brain exercises that can improve a child’s ability to control his or her own mental capabilities. Seek treatment early. Recognizing and addressing the signs of ADHD early in a child’s life may decrease the risk of substance abuse associated with medication. Children of all ages can benefit from alternative treatment therapies. Medication works differently based on the patient’s body chemistry. What works for one person may not work for another. The same is true for holistic treatment. To truly manage and combat a diagnosis such as ADHD, parents may need to explore several forms of treatment to address the problem at its root. Whether you want to avoid the risk of substance abuse or you’re concerned about the unknown side effects of prescription medications, natural alternatives to Adderall treatment may work best. Do your own research and choose a course of treatment you feel will protect your child now and in the future. Community Contribution: What Do You Think? As more studies raise concerns about conventional medications used to treat mental health diagnoses, what alternatives to Adderall should parents consider? Please share your thoughts in the comment section.